In a perfect world, my life would run smoothly and everything would go to plan. There would be no last minute changes to my schedule and my life would be …… well boring to say the least! Even though I bemoan the lack of time I seem to have, and the fact that my ‘to do’ list is growing, I love the busyness of my life. I am celebrating the abundance I am experiencing my just going with the flow. As my friend Chantelle says “too blessed to be stressed”. 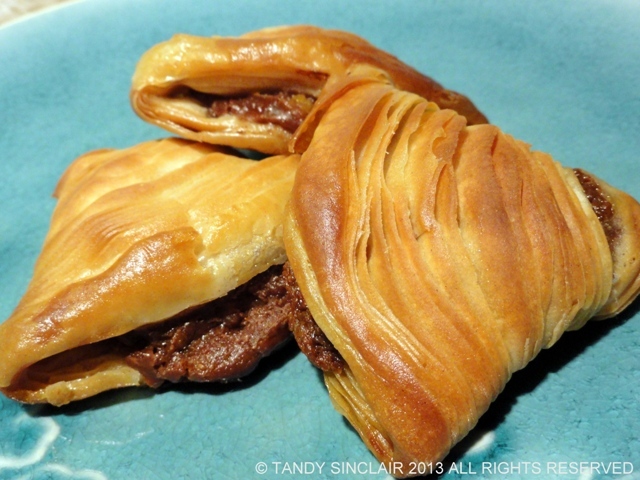 I made a Chocolate Confectioners Custard for my sfogliatelle and on a perfect blog, this recipe would have appeared first. But, I am far from perfect and so the recipe for the Chocolate Confectioners Custard is being posted after I used it. Thankfully this custard can be frozen as I made for too much for the sfogliatelle. I foresee some chocolate soufflés in my future! Pour the mixture back into the pan and over a medium heat, bring to the boil. Wow – these look really lovely! Great job! That is an amazing pastry Tandy! Nice job. Your pastry looks terrific and must be delicious with chocolate custard…I’ve only had vanilla. The pastry looks so crisp and the filling would be creamy and lush! This looks so amazingly decadent – fabulous! Delicious! I love chocolate anything! I am amazed at how you managed to fit in so much in your day Tandy. Something went haywire this morning when I tried to reply to your tweet, sorry about that.